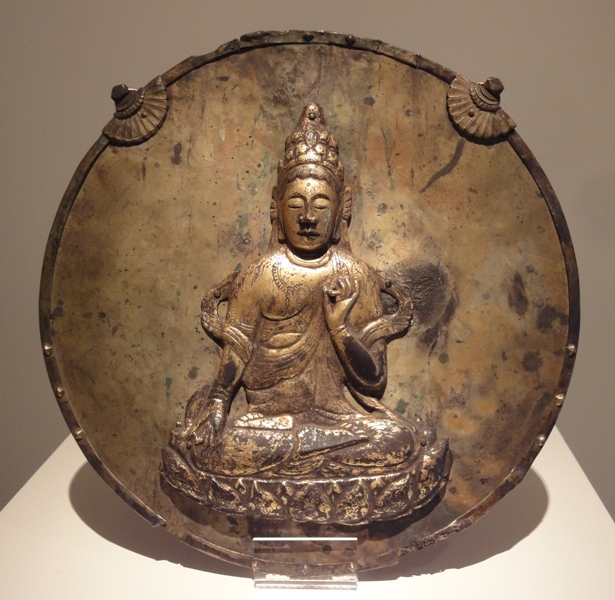 This kakebotoke is composed of a bronze image of Jūichimen Kannon riveted to a bronze disc. Unlike the mirror introduced last time, whose engraved deity is difficult to see clearly without careful inspection, this piece is more three-dimensional and can be clearly distinguished from afar. 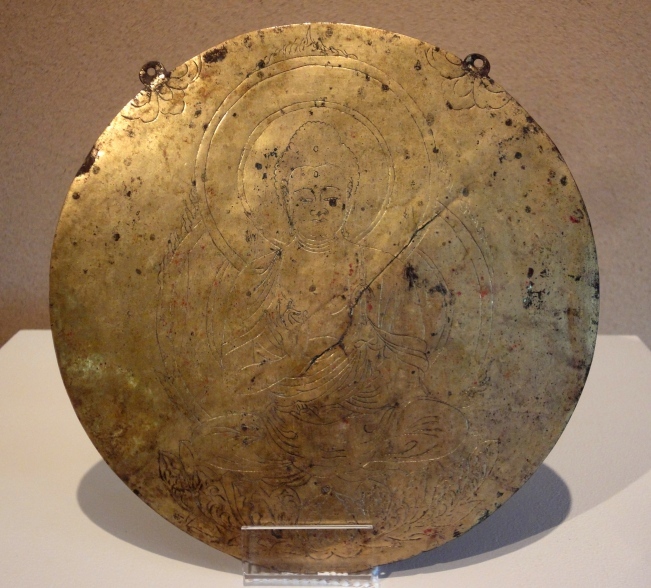 It is thought that three dimensional kakebotoke such as this were used as objects of worship that a number of people could pray to at the same time, whereas flatter mirrors with only engraved images were carried by mountain ascetics or pilgrims for personal worship. Though each of the faces of Jūichimen Kannon imagery are meant to have different expressions, all of the faces of this piece are charming and warm-feeling. 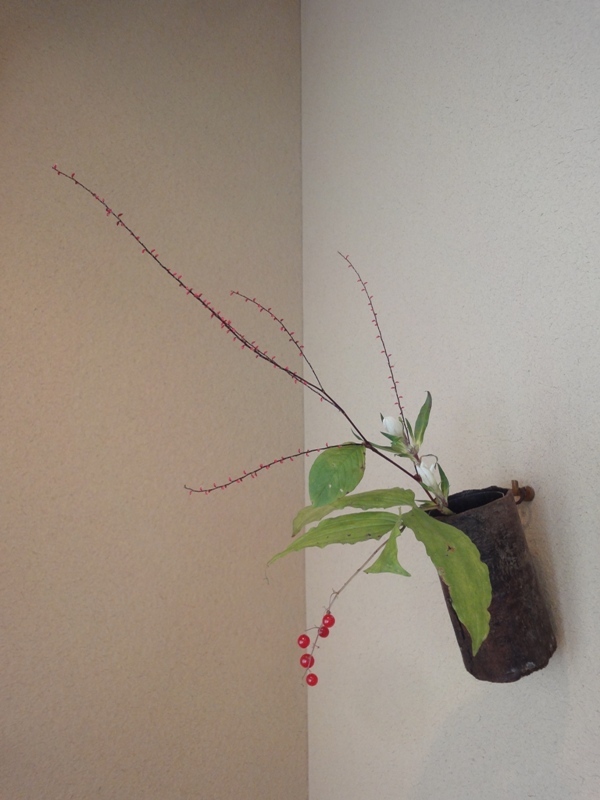 The showroom in Shirokane will be closed on Wednesday October 26th due to photography. The gallery in Roppongi will be open as usual, however, so please visit us there. Mishōtai are representations of native Japanese Shintō deities that have temporarily manifested in their Buddhist forms in order to save the people of this world. 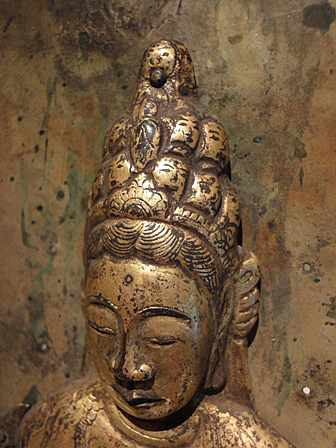 Different deities each assume a specific Buddhist form according to the honji suijaku theory of Buddhist-Shintō syncretism, and they are most often represented by engraved mirrors or "hanging Buddhas" called kakebotoke. 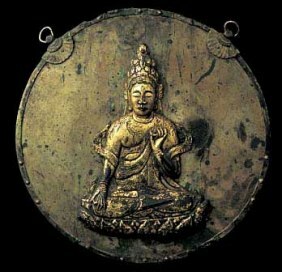 This is a bronze disc with an engraved image of Amida Buddha on its reflective surface, which would normally classify it as a mirror. But as the entire body of the piece is gilt and there are two small loops at the top that would have been used to hang the piece, it can also be considered a kakebotoke. 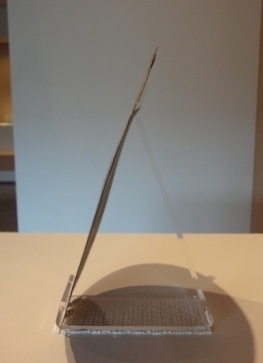 We can imagine in this piece the way that mishōtai began with engraving images on actual mirrors, and then gradually moved toward being suspended. From the side you can see how thin it is! 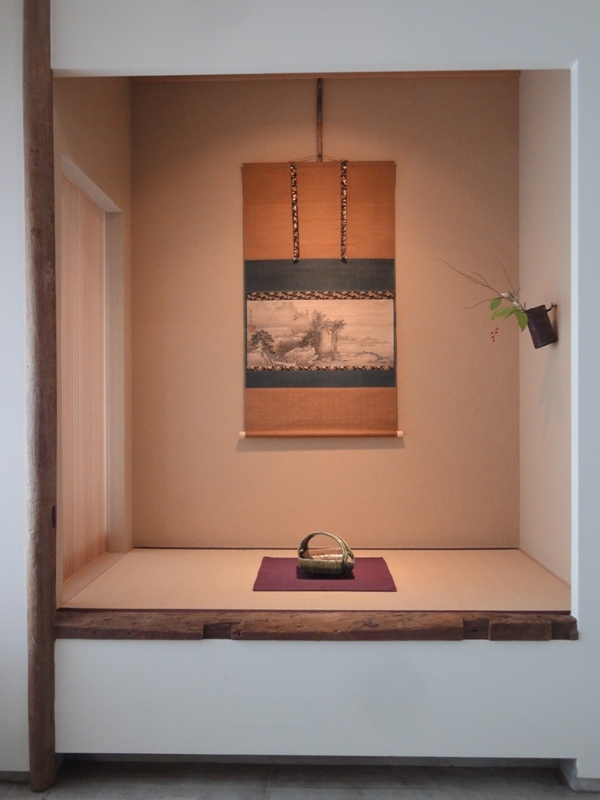 Today, October 15, the gallery in Shirokane will continue to be closed due to ongoing photography. Once again, we apologize for the inconvenience. 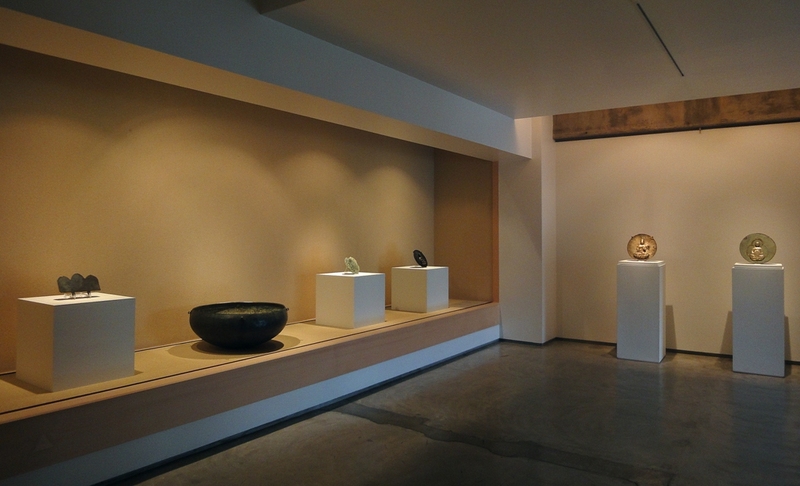 The new gallery space in Roppongi, however, will remain open today, so by all means please visit us there. The gallery will be closed on Friday, October 14, due to photography. We are pleased to announce the opening of the latest exhibition at the Shirokane gallery. This exhibition will focus on mishōtai, which are representations of native Japanese Shintō deities often appearing in their corresponding Buddhist forms in accordance with the honji suijaku theory of Shintō-Buddhist syncretism that was created in Japan. There will be an opening reception Tonight from 4:00pm until 8:00pm, along with the other galleries of the Shirokane Art Complex (Kodama Gallery 1F, NANZUKA UNDERGROUND 2F, Yamamoto Gendai 3F). We apologize for the inconvenience, but the gallery will be closed on Friday October 7th in order to set up the next exhibition. The exhibition opens at 4:00pm on Saturday October 8, and will last until 8:00pm. We hope you will stop by for a look at the show. The scroll is a landscape painting by Soga Shohaku (1730 - 1781). A closeup of the flowers: a species of monocot (yukizasa), bellflower (rindō), and Antenoron filiforme (mizuhiki). 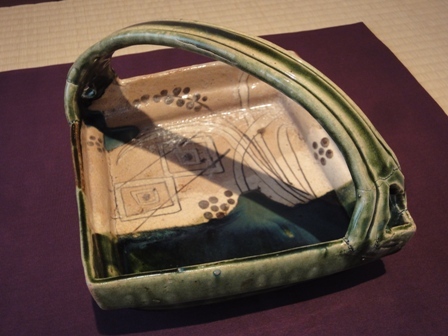 Please also have a look at the pattern on this handled Oribe ware bowl.